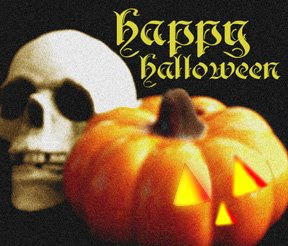 Happy Hallowe'en To All From Strange State! 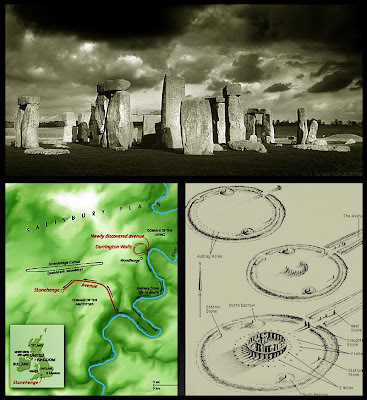 As I watched a documentary recently on the History Channel that discussed the ancient standing stone sites of pagan Britain, I was struck by how often archaeologists are baffled by just how these enormous stones got to their current location on the Salisbury Plain from where they were quarried many miles away. It seems an unimaginable feat to primitive neolithic peoples some 3,000 to 5,000 years ago (there's much debate). Yet, it is well-known that many of the enormous obelisks of ancient Egypt were floated up the Nile River from much further south where the stone was quarried. While undoubtedly smaller standing stone site, like those in the Orkney Islands, were constructed by hand, the megalithic sites like Stonehenge may have had some help. No, not the extraterrestrial kind. I mean the River Avon. To many scholars, like Mike Parker Pearson, head of the Stonehenge Riverside Project, the river is simply seen as the metaphoric passage from the land of the living, as represented by the "live" trees that once formed the lesser known Woodhenge, to the center of death rituals in pagan Britain. But what if the river served as the freeway upon which barges floated these massive stones from their source? The ditches and berms might have served as canals that further moved the stones to the site where they were floated into position before, once more, brute force was required to haul the stones into place. Now, I've personally no evidence to bolster this supposition, but I think it would be a fascinating hypothesis to look at for any scholar willing to try. "Creatures and Spirits of American Indian Lore" presents interpretations of the paranormal by American Indian artists through visual media and story. The event will continue to run through the 31st from 7 - 9 pm at the Standing Buffalo Indian Art Gallery at 106 E. Main in Norman, OK. For information, call 405-701-4060. The horror film, "Splinter", will premiere in Oklahoma City, which is apropos since director Toby Wilkins shot the film in Oklahoma. Wilkins is quoted as saying it is "one of the few places you can still find isolated, rural pockets of civilizations, like gas stations in the middle of forests..."
Among the actors featured in "Splinter" are Jill Wagner ("Blade: The Series") and Paulo Contanzo (from the "Friends" spinoff, "Joey"). Many Oklahomans served as extras and crew. The film, which seems to be no-frills straightforward sci-fi horror flick (read more here SPLINTER), has picked up six awards from the eighth annual Screamfest horror film festival held each year in Hollywood. "Splinter" will screen at the Oklahoma City Museum of Art's Noble Theater (415 Couch Drive) at 7:30 pm on Thursday, October 30. Ticket prices are $8 for adults, $6 for seniors and students, and $5 for museum members. For more information contact 405-278-8237 or visit www.okcmoa.com/film. 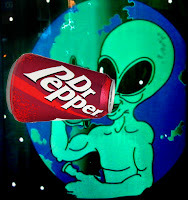 The denizens of the quiet Texas town of Dublin (home of Dr. Pepper) were startled by the appearance of UFO's in the night sky Thursday, October 23, 2008. Among the witnesses were high-schooler Andy Monroe, his friends, and his mother. They all claimed to witness a ring of lights that flickered overhead. Monroe had the presence of mind to shoot 30 seconds of video before the object vanished. Throughout the town, more than a dozen individuals have come forward to report the lights. Many more are unwilling to go on record. Some reported lights like Monroe saw, and others claim to have seen trios of lights spaced equidistant. The Air Force announced F-18's were flying in the area. However, several witnesses claimed they had seen the strange lights only after the F-18's had departed. Are these lights related to the phenomena reported earlier this year in and around Stephensville, TX? If so, what exactly is being seen by witnesses throughout the Lone Star State? Are there innocuous explanations for these strange sightings but the Stephensville incident has irreparably colored them as UFO's? No one can yet say for certain what is happening. The best thing to do for now: keep looking to the sky for more answers. 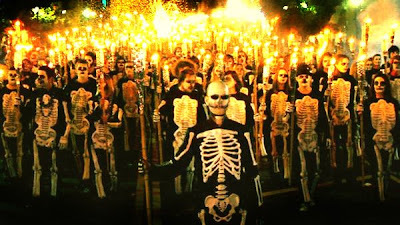 A death-march dubbed "Ghouls Gone Wild" paraded the streets of Oklahoma City this past weekend. Hundreds gathered in ghoulish get-ups to celebrate the second year of Oklahoma City's Halloween answer to "Burning Man," which culminated in a torch-lit procession through downtown. The event is the brainchild of Flaming Lipps frontman and local, Wayne Coyne, and is in part sponsored by the Oklahoma City Gazette. This year's Grand Marshal was April Wahlin of Fox Reality TV's "Next Elvira". 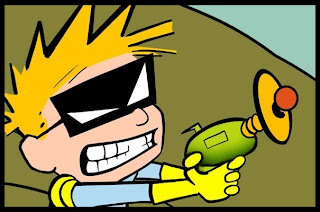 I wrote the following on a lark, but was dismayed to find out that the main character's name and title were already in use by an internet comic. Such is the life of a writer. I couldn't think of a suitable replacement that would inspire me to finish writing about this adventurous hero. Had the death ray been properly calibrated, Danny Dare, Boy Adventurer, would have been toast. As it stood, Danny’s nemesis – the so-called Doctor Archibald P. Necropolis – still had a few things to learn about disintegration guns. Necropolis smacked the gun angrily and Danny took full advantage of the evil doctor’s shift in focus. Crouching low, Danny raced in a broken sprint toward the cargo containers, barely missing the beam that grazed past his shoulder. Hidden behind the immense, metallic storage boxes, Danny knew he had scant seconds to come up with a plan before his atoms were scattered like so many marbles into infinity. BLAST! Danny couldn’t help but chastise himself for having left behind the molecular syncopator . . . But he had no time for self-recrimination. The crackle of static from his wrist communicator told Danny it was time to get back to work. "Dare here, Carl. Necropolis has me pinned down." Another death ray blast ricocheted only two feet from Danny’s position. He could hear Necropolis’ maniacal laughter as it echoed throughout the cavernous space. "Don’t worry, Danny. We’re outside the cargo bay now. We’ll draw his fire if you can get to the rear hatch." Carl’s tremulous voice belied his man-of-action words. Danny knew the junior officer was quaking in his boots. He would just have to deal with it on his own. "No can do," Danny commanded. "I want you to count to ten and then come in, guns blazing!" Danny cut the transmission; there was no time to argue with Carl today. Danny climbed the nearest stack of cargo containers until he reached a pipe running out from the wall into the ceiling. Using this as a fulcrum, he swung back lightly from the stack of containers like a gymnast. As Danny reached the apex of his outward momentum, he kicked on the rocket boosters in his boots and shot forward again, kicking the precarious stack with a mighty force. The stack of boxes teetered violently and then, like the great wobbly neck of some dinosaur, the whole structure collapsed forward. Boxes skidded out across the smooth floor of the bay, smashing into other cargo and, more importantly, into Dr. Necropolis. The evil doctor yelped fiercely, dropped the ray gun, and fell back beneath the weight of an oncoming cargo container. At the same instant, the forward hatch exploded open in an acrid cloud of smoke. Carl Jannsen burst through with half a dozen soldiers, guns at the ready. However, as the smoke cleared, the truth of the scene was revealed. Standing akimbo, with one leg triumphantly perched atop the crate pressing down upon the nefarious Dr. Necropolis, was Danny Dare, Boy Adventurer. 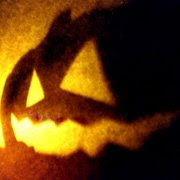 Sprague (CT) - Some folks on the library's board of trustees were just a little spooked. What's that? A real live witch was going to practice his craft at the library on Halloween? In front of children? Yes, said Linda Puetz, president of the Friends of Sprague Public Library. And the witch, the Rev. Rapid Cabot Freeman, was going to charge admission and donate the proceeds to the library. The board, Freeman said, seemed reassured. But, in fact, everyone was not “cool with it.” Several members of the library board went to First Selectman Catherine Osten to complain that the Friends of the Library had presented the matter as a fait accompli. "They had a library board meeting, and the library board was told that the first selectman had already approved the event, and the board had no say in it,” Osten said Monday. “So the library board came to me and said, 'Did you approve a pagan ritual?' And I said, 'No, I did not.' "
“In fact," Osten said, "because the event was to be held not in the library proper but in the town community room upstairs, those planning it had to get a permit from her office to use the room. Since no one had sought a permit, or paid the $50 rental fee and the $50 cleaning deposit, she said, there would be no witchcraft there on Halloween. Freeman, who said he reserved the room four months ago with librarian Barbaranne Warner, and who has been advertising the party on his public access television show - “The Witching Hour” - for the past six weeks, said he believes it is a matter of religious discrimination. He said he'd been planning the appearance since he spoke at the library about witchcraft last year and members of the audience asked him to give a demonstration. While the town has allowed everything there from Christmas parties to christenings, he said, they are banning him because he's a pagan. For her part, Puetz was furious. So furious that she put out a five-page statement excoriating the first selectman. Baltic, of course, is the heart of Sprague, where the old grist mill housing the library sits across the street from Town Hall. On that same night, the fire department, she pointed out, is hosting a Halloween party, and the department is located in a building belonging to the town. "If Mr. Freeman is not allowed to have his event on October 31, it may be a discrimination issue,” Puetz said. Meanwhile, Freeman said he was saddened and angered by the selectman's “Hitleresque decree” and her failure to return his calls. The library has had a special place in his heart ever since he was a boy growing up in Baltic, he said. For it was there he discovered witchcraft, by reading books by famous witches, and dreamed of someday meeting them. "That was my rocket ship to get where I needed to be. And I want everybody to have the same ride to wherever they need to go. Following in the footsteps of Ken over at Spooked and Buck over at Buck's Ghosts and Hauntings, I present to my readers some thoughts on just what I believe at present. Of course, these thoughts could change over the years when new data becomes available. Ghosts and Hauntings - Yes, I would say I do believe in those phenomena we categorize as Ghosts or Hauntings. However, I am not yet convinced we have a handle on just what we are witnessing. Are they truly disembodied, earth-bound spirits? Are these phenomena related to the vastly unknown realm of quantum physics; tricks of time-space? Or are they, as some think, projections of the psychic mind. Perhaps they are actually comprised of a combination of these things. So, while I believe in what is being witnessed, my jury is still out on just what is being witnessed. EVP - Yes, I think there are some very real EVP's being collected, but whether we are looking at the transcription of radio communications to audio devices or picking up leaked sounds from another dimension, I can't yet say. It warrants further study. I will say this however, there is a lot of bunk EVP's out there. A lot of people are very willing to hear what they will in random noise. Orbs would fall into this category too. Quite simply, I would say that 99.9% of orbs are particulate contamination on a photographic or digital image. While, I believe that some have witnessed glowing balls of light (spooklights, will o' whisps, etc..), I don't think most of what is caught on film is legitimate. UFO's - Similarly, I believe that the phenomena we call UFO's might be comprised of many different, unrelated incidents. Some indeed may be as banal as Venus or misidentified aircraft. While some - precious few - remain truly unexplained and may either represent extraterrestrial or extradimensional craft of some kind. We simply don't have enough information and, as with many of these phenomena, is awash in hoaxes and self-reinforcing delusions. Psychics - Quite simply I think there are far, far fewer than psychics than we are led to believe, usually by "psychics" themselves. I think there is enough credible scientific data to indicate that the human mind - especially for a small percentage - holds some capabilities beyond those of most. But I also think that it varies from person to person in both strength and frequency. So, some might be very "gifted" while others just have sporadic bouts of insight. Are We Missing The Yeti For The Tracks? "A team of Japanese mountainclimbers, on an expedition to Nepal in search of the legendary Abominable Snowman, also known as the Yeti, are claiming that though they haven't been able to secure film of the creature, the footprints in the snow they have measured and photographed are 'proof enough'. Do footprint photos and measurements bring enough authenticity to this claim to satisfy you?" If they were asking me specifically, I would have to say no. But that's where investigations into these hirsute hominids often end. Tracks have become, for many, proxies for specimens. Instead of being the trail of breadcrumbs that lead researchers through the woods (literally) to this ever-elusive quarry, tracks have become the stopping point for many who must - deep down - think there is little chance of ever finding a specimen. It's a second-place prize that the field has grown too comfortable accepting - to the point that the big win is, as the excerpt suggests, video footage. But history has shown us with brutal clarity how little scientific value is to be had in blurry images shot from afar. So, while I think these tracks are of great value to researchers, they are not the stopping point, and are by no means "proof enough". Tracks simply serve as rewarding reminders that they are on the right path, so to speak. So, after all the hoaxing of late, maybe next time they can hold off on the press conference. After all, who doesn't have a track, right? 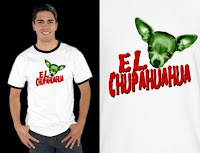 You can purchase the design in various incarnations via cafepress.com at this link. Widows and Witchcraft - PA Family Fought Spell? In February 1949, a strange series of events unfolded in Altoona, PA - made all the stranger by the complicity of the local county authorities. U.S. Army Pvt. Reuben Rock died of tuberculosis January 13, 1949 and was laid to rest in Upper Claar cemetery. It seems that after his death, his inlaws became convinced that their daughter, Rosella, was being haunted by his "restless spirit." According to her father, Arthur Dively, she could neither eat nor sleep and had begun wasting away. Her parents became convinced she had been placed under a spell and that Rock had practiced witchcraft. "[he] had strange books and things in his house," Mrs. Dively claimed. It would seem that what would appear to most as normal expressions of grief, were to the Dively family indications of malicious magic at work. At first, the Dively family believed Pvt. Reuben had placed a charm upon a favorite picture of Rosella. They located the photograph and destroyed it, but the Dively's believed Reuben's ghost still clung to their home. "We could even feel it right in the room with us. 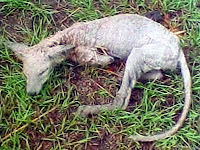 It knocked at the windows and screamed over the top of the house." 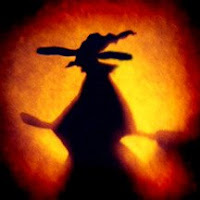 The latter phenomenon calls to mind the Irish legend of the bean shìdh, which wails over a family's home to herald pending doom. Considering that Dively is an Irish name (from Divilly, which was in turn Angliicized from Ó Duibhghiolla) and that the largest concentration of this surname at the time was in Pennsylvania, we begin to see some of the foundations of what may have transpired here. In any event, the County - strangely enough - allowed the exhumation of his body for the purpose of quelling his spirit. Then things really get weird. Believing that it had been a mistake to have buried Pvt. Reuben in his uniform when it had been promised by him to Rosella, the family stripped it from his body, doused it in gasoline, and set it on fire. His remains were then sprinkled with salt, ostensibly to bind evil spirts, and then the corpse was wrapped in a white sheet and set back into the grave. At this point, Rosella's father finally believed his daughter was free of the spell that had been been steadily pushing her toward a nervous breakdown. Thereafter, the family claimed, her health returned and all was quiet in the sleepy hamlet of Altoona, Pennsylvania. A paranormal investigator by the name of Kristen Sheley sent these images to Paul Dale Roberts, investigator and columnist for the webzine, Alien Seeker News. 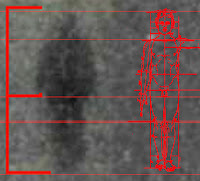 Sheley claims the images depict a full-body apparition captured in one frame but not in the next. And there does seem to be some man-like object at the end of the hall. As someone who has studied art extensively, I can tell you the proportions are mostly correct. However, we would have to assume this individual is obese or wearing a heavy winter coat with his or her hands inside its pockets. It seems the hands don't quite reach down to where they should if they were just resting at his or her sides. Purported full-body apparitions caught on film or digital media are increasingly rare these days. Orbs or Spirit Mists seem to be all the rage. But there was a time when most all ghost photos were of these apparitions. However, through years of debunked hoaxes, the concept fell out of vogue - no one trusted them to be true anymore. It was too much to hope for, I suppose. We can't be certain how strict Sheley's methodology was. Were she and her fellow investigators wandering aimlessly, snapping photos like foreign tourists, unaware of each others movements? I've seen it many times before. It does happen. But maybe we should give this investigator the benefit of the doubt. Perhaps she has captured what few have - for what good it does us. It's a great photo but does it draw us any closer to understanding these phenomena? Will it sway the unrepentant skeptics? I wouldn't bank on it - nor will they. Perhaps this investigator will continue to study this location and only this location in hopes that further data will arise. But I doubt it. Chances are this team has already carved a notch in their headboard and moved on. I think only time-intensive studies of active sites using strict protocols will yield the results necessary to begin properly tackling enigmas such as full-body apparitions. Recent research might better explain the phenomenon of noctilucent clouds - and some UFO sightings as well. 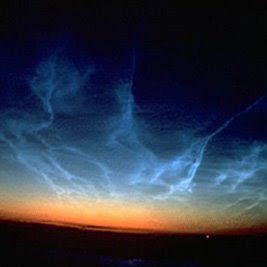 Noctilucent (meaning night-shining) clouds appear at the far reaches of the atmosphere and were first described in 1885 following the extraordinary eruption on the Indonesian island of Krakatoa. This massive explosion released plumes of ash 50 miles into the mesosphere and affected global climate for several years. According to Paul M. Bellan, a plasma physicist from Caltech, Krakatoa also produced these noctilucent clouds. Best seen at twilight in the summer months between 50 and 70 degrees latitude (north and south), the clouds seem to shine an electric blue. When this aspect of the phenomenon was first noted a quarter century ago, scientists were puzzled. However, Bellan now thinks the ice grains comprising the clouds are laced with a thin layer of sodium and iron from meteorites burning up in the atmosphere, which reflects the radar signals. "If you have metal-coated ice grains in noctilucent clouds, the radar reflectivity can become enormous," Bellan explains. "This reflectivity is not the sum of reflections from individual ice grains, which would not produce a very large reflection. Instead, what happens is that ripples in the cloud of metal-coated ice grains reflect in unison and reinforce each other, somewhat like an army marching in step across a bridge causes the bridge to vibrate." Could such phenomena explain "phantom targets" sometimes reported on various radarscopes when inversion layers and such cannot explain the objects away? It certainly could not rationalize those targets spotted at lower altitudes but for those rare UFO reports in the higher reaches of the atmosphere, there now exists the ability to rule out noctilucent clouds. While no quantitative analysis may yet have been done to establish October's ranking among the high months for high-strangeness, I'm certain we can all rest assured it's up there. The following Oklahoma accounts reflect the mystery and magic inherent to the Hallowe'en season. You can read more about them in the non-fiction work, Strange State: Mysteries and Legends of Oklahoma, of which we've a few more copies. 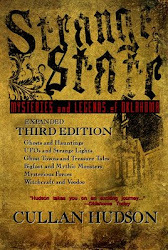 So, if you're interested, e-mail me at strangestateok @ yahoo.com. A canyon near the old Fort Arbuckle at Davis was the site of a battle fought between the Army and tribe from the region. It said that the battle took place on October 31st. Legend claims their ghostly wailings can be heard still today at the canyon's "moaning cave". One of the best times to catch a glimpse of the forces that haunt Fort Washita is the last night of October, according to locals. In October 1971, three young men took up occupancy of the old, abandoned Alva General Hospital in their new jobs as security guards. They weren't prepared for the ghostly shennanigans that ensued as electronic problems, showers that turned on themselves, and mysterious reappearing blood stains. A mysterious oval-shaped object was witnessed in the sky over Oklahoma City on the evening of October 28, 1957 by Mr. and Mrs. Robert A. McCulloh and their neighbors. Late October saw a rash of UFO sightings across Oklahoma in 1973. Newspaper editor, David DeLand, recounted his own experience in the Muskogee Daily Phoenix. Recent documents reveal Britain's Ministry of Defence toyed with psychic prognostication in their war on terrorism as recently as the weeks and months following 9/11. Makes one wonder if the CIA has truly abandoned efforts like the Stargate Project. And continually we see law enforcement agencies bring psychics in to aid in missing persons cases, etc... With so many high-profile agencies willing to take this leap of faith, I am forced to either believe they are naive and at times desperate enough... or they know something we don't. Noted author and cryptid-hunter, Nick Redfern ,will be speaking at the J. Erik Jonsson Central Library in Dallas, TX Tuesday, October 14. Topics will include: Bigfoot, Werewolves. 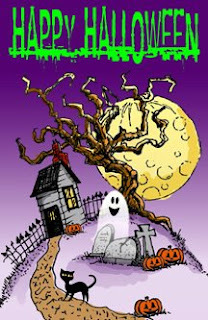 "Ghost Hunting In Texas" on October 7, featuring the Dallas Area Paranormal Society. "Psychics Among Us!" on October 21. Psychic Kim St. Andre talks about her life as a medium. So, if you are in the area, be sure to check out these exciting events. If you do attend, feel free to pass on your thoughts afterward. I would love to hear and post about any or all of these lectures. Video of a "ghost" caught on a cell phone camera at a hospital morgue somewhere in Columbia. To me, it looks like someone backing up and coming closer to a pane of glass, possibly holding something in his or her hands - like a baby. There are also some distortions to the architecture of the passageway that make me think we're not seeing things as they appear. Again, possibly because of filming through a pane of glass. Bigfoot Afoot! Regional Events Throughout October. For those in the Oklahoma, Arkansas, Texas region, two prominent events are slated for this month. 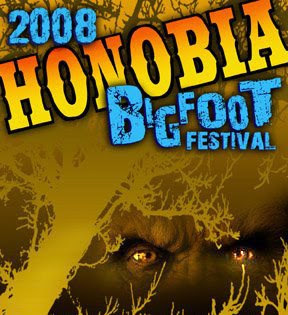 This weekend, October 3rd and 4th, you can attend the Honobia Bigfoot Festival, which is held in Honobia, OK - deep in the Kiamichi Mountains, a Bigfoot hotspot that has been the site of numerous research expeditions and documentaries. 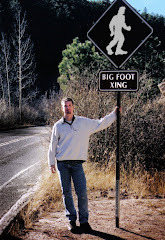 And later on, the Texas Bigfoot Research Conservancy will hold its annual conference on Saturday, October 18 2008. The event, held in Jefferson, TX, will run from 9:00am to 6:00pm. For more information, click here.